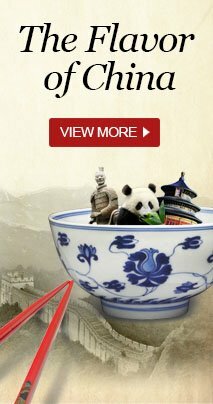 China has many regional foods due to its expansive territory and varied local cultures.Some of the most popular Chinese cuisines include the "Eight Great Cuisines" (Cantonese, Sichuan, Anhui, Shandong, Fujian, Jiangsu, Hunan, and Zhejiang), along with Beijing cuisine and Xinjiang cuisine. Each regional cuisine has its own features. Here we have selected 10 specialty dishes from the above 10 regions to help you understand China&apos;s regional food. Slow-boiled soup (老火汤 lǎohuǒtāng /laoww-hwor-tung/ &apos;old fire soup&apos;) is usually a clear broth made by simmering meat and other ingredients over a low heat for several hours. Usually traditional Chinese medicines and herbs are used as ingredients, including China root (tuckahoe), goji berries, and caterpillar fungus. It is believed that slow-boiled soup can heal and strengthen one&apos;s health. 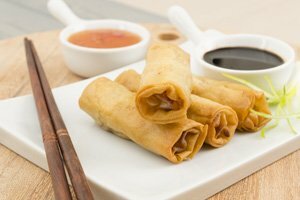 Learn more about Cantonese Cuisine. Beijing cuisine is an eclectic and classic Chinese cuisine that absorbs the essence of cuisines from different cultures. It is famous for its imperial cuisine (宫廷菜 gōngtíngcài /gong-ting-tseye/) originating from the Emperor&apos;s Kitchen in the Forbidden City. The cuisine is characterized by strong seasonings, like vinegar, garlic, coriander, leeks, and salt. 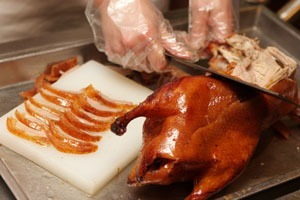 Peking roast duck is an internationally famous dish. The duck is roasted to a shining red color, and characterized by its crispy skin and tender texture. It is usually sliced thinly and eaten wrapped in a wheat pancake together with scallions, cucumber, and hoisin sauce. To enjoy the best Peking duck, visit a famous Quanjiude Roast Duck Restaurant or Pianyifang Roast Duck Restaurant. Sichuan cuisine has an international reputation for being spicy and numbing, due to the use of Sichuan pepper (花椒 huājiāo /hwaa-jyaoww/ &apos;flower pepper&apos;) and chili peppers. It is widely served in China, and most of its dishes are cooked by fast-frying. 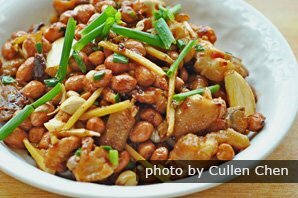 Kung pao chicken (宫保鸡丁gōngbǎo jīdīng /gong-baoww jee-ding/ &apos;palace-kept chicken cubes&apos;) is a traditional Sichuan dish made with chicken, chili, Sichuan peppers, peanuts, and vegetables. The chicken tastes tender and smooth, and the flavor can be either spicy or mild according to how much chili is added. Learn more about Sichuan Cuisine. 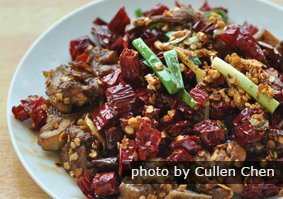 Hunan cuisine is known for its spicy flavors and preserved ingredients. Compared with Sichuan cuisine, it is spicier, but not numbing (so the dish below is a bit of a misnomer). It is rich in the use of seasonal ingredients. Numbing spicy chicken (麻辣子鸡 málàzǐjī /maa-laa-dzuhjee/) is a typical Hunan dish that tastes tender and spicy —chicken cubes cooked with red chili peppers and scallions. In order to make sure of the tenderness and freshness of the chicken, it is usually marinated for a while with soy sauce, sherry, and ginger before cooking. 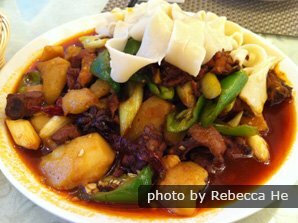 Learn more about Hunan Cuisine. Jiangsu cuisine is characterized by a light and fresh taste. It is known for its cutting techniques and elaborately-shaped dishes. Sweet and sour mandarin fish (松鼠桂鱼 sōngshǔguìyú /song-shoo gway-yoo/ &apos;squirrel mandarin fish&apos; or &apos;squirrel Chinese perch&apos;) is a typical Jiangsu dish with a fresh and delicious flavor.The dish tastes crisp at the surface, and soft and tender in the middle. The mandarin fish is usually carved into a squirrel shape, and deep-fried until becoming golden brown, then served with a sweet and sour sauce drizzled on the top, and at that moment a squeak that sounds like a real squirrel can be heard, adding interest to the name of the dish. Learn more about Jiangsu Cuisine. Fujian is well known for fresh seafood, because of its coastal position. Its specialism is soup making, and its chefs display expertise in applying various kinds of seasonings. Fo tiao qiang (佛跳墙 fótiàoqiáng /for tyaoww chyang/ &apos;Buddha jumps wall&apos;)is a variety of shark fin soup in Fujian cuisine. It takes about three days to prepare, and is known for its marine taste and usage of about 30 mostly high-class ingredients, such as abalone, shark&apos;s fin, scallops, and sea cucumber. 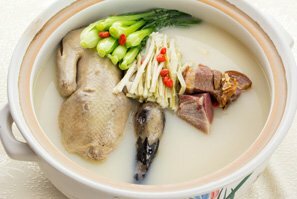 Learn more about Fujian Cuisine. Shandong cuisine, one of the important components of Chinese culinary art, is the representative of northern China cookery. 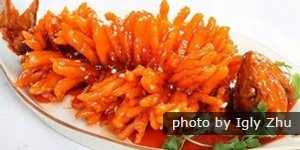 It is variously salty, fresh, tender, fragrant, crisp, and sweet and sour. It is famous for its soups and its fresh seafood. 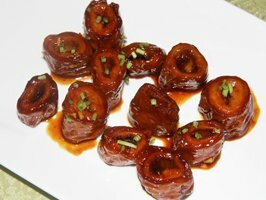 Braised intestines in brown sauce (九转大肠 jiǔzhuǎndàcháng /jyoh-jwan daa-channg/ &apos;nine turns colon&apos;) is a famous Shandong dish. Although the name of this dish doesn&apos;t sound particularly appealing, skillful Shandong chefs cleverly combine sour, sweet, fragrant, spicy and savory flavors, and make it a real delicious dish. The main material is pork intestines. This dish is elaborately made by a series of cooking techniques including boiling, deep-frying, and stewing. Condiments used in this dish include various spices, soy sauce, sugar, and vinegar. Learn more about Shandong Cuisine. 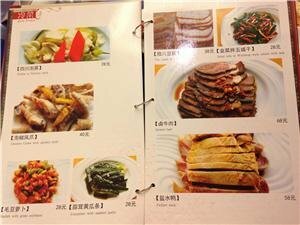 Zhejiang cuisine has a good reputation for freshness, tenderness, softness, and smoothness of its dishes with a mellow fragrance. It is extremely elegant in appearance. West Lake fish in vinegar gravy (西湖醋鱼 Xīhúcùyú /sshee-hootsoo-yoo/ &apos;West lake vinegar fish&apos;) is a famous Zhejiang cuisine with a sweet and sour flavor. It is made with fresh grass carp from West Lake in Hangzhou. Chefs cook the fish with a special method to render it fresh and tender. The sweet and sour sauce is a thick, black paste of vinegar and sugar. 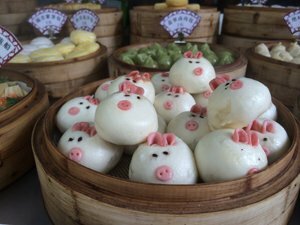 Learn more about Zhejiang Cuisine. The flavor of Anhui cuisine features saltiness and freshness, concentrating heavily on maintaining the original flavors and preserving nutrition of the ingredients. Its cooking methods are mainly braising and stewing, paying less attention to frying. Red-braised fermented mandarin fish (红烧臭桂鱼 hóngshāochòuguìyú /hong-shaowwchoh-gway-yoo/ &apos;red-braised stinky mandarin fish&apos;)is one of the signature dishes of Anhui cuisine. It is known for its special flavor — a salted and pungent smelling fish. Before cooking the mandarin fish is marinated in light brine, fermenting for a few days until releasing a very pungent smell (similar to blue cheese and stinky tofu), then braised in soy sauce with chopped bamboo shoots. Although its smell is not so pleasant when you eat it the first time, once you get past first impressions, you&apos;ll be rewarded with a unique flavor that&apos;s highly addictive. Learn more about Anhui Cuisine. Because Xinjiang is the home to ethnic Muslim people, their food is halal.Xinjiang-style food is characterized by roast mutton, kebabs, roast fish, and rice to be eaten with the hand. Uygur people are very hospitable; they like to treat guests to heavy sauces on top of hearty meat dishes served on gigantic plates. Da pan ji (大盘鸡 dàpánjī /daa-pan-jee/ &apos;big plate chicken&apos;), just like the name, is a big plate of chicken stewed in a rich, spicy sauce with noodles, potatoes, onions, green bell peppers, and chilies. 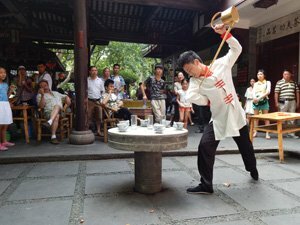 Or we can help you tailor make a china tour to add any culinary experience to your itinerary.